Bricklin SV-1 : future Tucker 48 ? I learned about the existence of the 1948 Tucker from a magazine article on the Bricklin when the Bricklin was being built. Around 1979, I called the Ventura area of California, and talked at length with Alex Tremulis ( Designer of the 1948 Tucker ). After reading the article and talking with Mr. Tremulis, I just had to see a 1948 Tucker in person ! He indicated that there was a man that lived close to me, a Mr. Stephen Nicas, who owned a Tucker. I contacted Mr. Nicas who lived in the Inglewood area of California at the time. He kindly showed me His 1948 Tucker # 17 ( 1017 ). Needless to say, I quickly became a Tucker enthusiast. As I understand, the last Tucker to be rescued for restoration, occurred around the 1973 - 1976 time frame, and was Tucker # 26, found in Michigan. As I recall, the car was purchased for around 6,500 dollars, and came with some other Tucker items as well. What a deal ! Not only was it only one of 51 Tuckers built, but it was also one of only 2 Tuckers built with an automatic ( " Tuckermatic " ) transmission ! 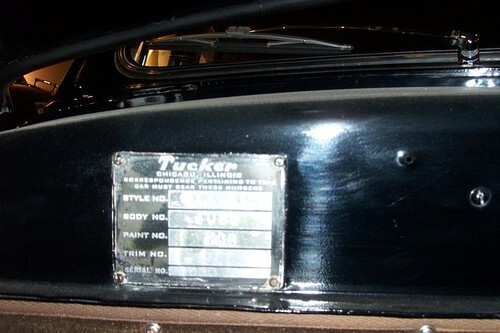 The other Tucker that had an automatic transmission was Tucker # 42. By the time peroid 1983 - 1984 rolled around, I recall 3 Tuckers for sale in the 40,000 to 60,000 dollar range. I felt the price was realtively reasonable, all things considered. This was out of my price range though, and the timing could not have been worse. Economic times had been very rough since the recession of 1982 ( this was the year I graduated from college ) ! I felt that here was the worst recession going on, since the Great Depression of the 1930's. Being a Business Major with a concentration in Economics, at least I knew why good jobs were so scarce at the time. The Economic Laws of Supply and Demand were doing their job, as I had been taught. In the year 1988, The Motion Picture: "Tucker The Man and His Dream" was released in the theatres. After this things really changed. As I understand, Tuckers have changed hands in the perhaps 250,000 to 500,000 dollar range since the Movie came out. The current record sale price for a Tucker is now reportedly 700,000 dollars for Tucker # 43. What happened ? Did it take a major motion picture to bring appreciation, and prices of Tuckers to to the level they hold today ? Were the car collectors and enthusiasts asleep, or complacent, prior to the movie ? The Tucker and the Bricklin, in terms of time, are about a generation apart. One is a sedan, the other is a sports car. Both cars share a prototype with a distinctive name: Tucker ( the Tin Goose ) and Bricklin ( the Gray Ghost ). Both cars were innovative and safety oriented. Both are very beautiful and distinctive. Both were orphaned automobiles by manufaturers that went under. Both cars are head turners, and have an extremely high appeal factor. When both came out, the supply could not keep up with the demand, and the enthusiasm level for each went through the roof ! When you see a well taken care of example of either car, it is like a breath of fresh air. It is an exciting and exceptional experience ! The Tucker has had a good survival rate. With 51 examples built, only 4 are considered to be non-survivors: # 18, # 23, # 27, and # 42. Of the 4 non survivors, # 18 and # 42 losses were probably preventable. As I understand, at least some pieces of each of the 4 non-survivors are still around. With the Bricklin, it is much harder to tell. Getting information can be extremely difficult. At times, the amount of un-cooperation among Bricklin Owners, and clubs, can be incredilble based on my experiences. There were more people in the world in the mid 1970's than in 1948. Today there are some 6 billion people on the planet. The Tucker is extremely rare. The Bricklin is rare. Even if all 2906 ( VIN's 773-780 were not built ) Bricklins built had survived, the car would still be rare. To put this in perspective let's look at it in 2 different ways. If a Major League Baseball stadium holds 50,000 people, and only 2906 people were in attendance, the stadium would look quite empty. Or if you take 2906 cars and divide it by 50 United States, this would leave an average of only 58 to 59 Bricklins per State. This is does not even include Canada, which spreads it out even thinner. It seems that far less than 2906 Bricklin SV-1's are around today, and considered to be survivors. Do we need to have a major motion picture made and "billed as": for the public relations department of Bricklin Canada Ltd., / General Vehicle Inc., and released in the theatres, to raise the appreciation level of the Bricklin SV-1 to where it should be ? This should not be necessary. Today there are many more Tuckers in museums than in the 1980's. As with any classic car, it is the original, either kept that way, or restored that way, that is the classic museum piece. It is the "stock / original" car that shows what the vehicle was intended to look like as built. With new vehicle prices in the, say, 15,000 to 60,000 dollar range, how does the Bricklin look ? If Bricklin SV-1's are selling in the 1500 to 20,000 dollar range, depending on condition, seems like a no brainer ! Finally, good points to keep in mind concerning the Bricklin SV-1 are: ( 1 ) Save a Number ( that is: a Bricklin ), instead of using one as a parts car to keep another going. With the possible exception, of some interior parts which are now hard to obtain, but not impossible, there should be enough parts around, to keep your Bricklin going, or restore the one you have. This prevents more Bricklin's from moving into the past history status. ( 2 ) Keep them original. If you feel you need to customize your Bricklin for some reason, it is better, to do something that you can easily reverse in no time, rather than making a modification that is going to take major car surgey to fix at some point down the road. The Bricklin, as built, has a lot of class, and is truly worthy of being a classic car. ( 3 ) Don't take your Bricklin lightly, no matter what condition it is in. It is to be appreciated. Addendum.. January 3, 2009. Tucker # 38 ( 1038 ) reportedly sold in August 2008, for a record $925,000 plus Buyer's fees, which brought the total to: $1,017,500. This is remarkable when one considers the financial condition of the world in the year 2008, some employment / financial figures being being compared to the early 1980's, some back to the early 1930's during the Great Depression. 1948 Tucker number 18 ( 1018 ) is one of 4 Tuckers that is not considered a survivor today. It reportedly broad sided a tree at speed in sometime in the late 1940's or early 1950's and was totaled. It was one of the few Tuckers that was painted beige, paint code 400. 1948 Tucker Data Plate ( original ), Tucker number 30 ( 1030 ), on display at the Peterson Automotive Museum, Los Angeles, California. Data Plate info: Style No. 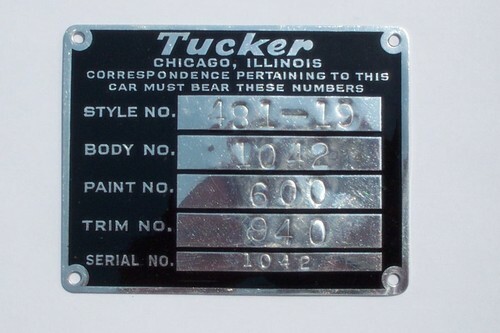 : 481-19 ( Tucker code for a 4 door sedan ), Body No. : 1030, Paint No. : 100 ( 100 was Tucker's code for exterior color of Black. FYI .. 200 was Waltz Blue, 300 was Green, 400 was Beige, 500 was Gray, 600 was Maroon ). Trim No. : 940 ( custom pleated cushions ) FYI ... Interior trim No. 900 : (unknown - appears only to have been used on Green Tuckers), Trim No. 920 was plain seat cushions. Serial No. 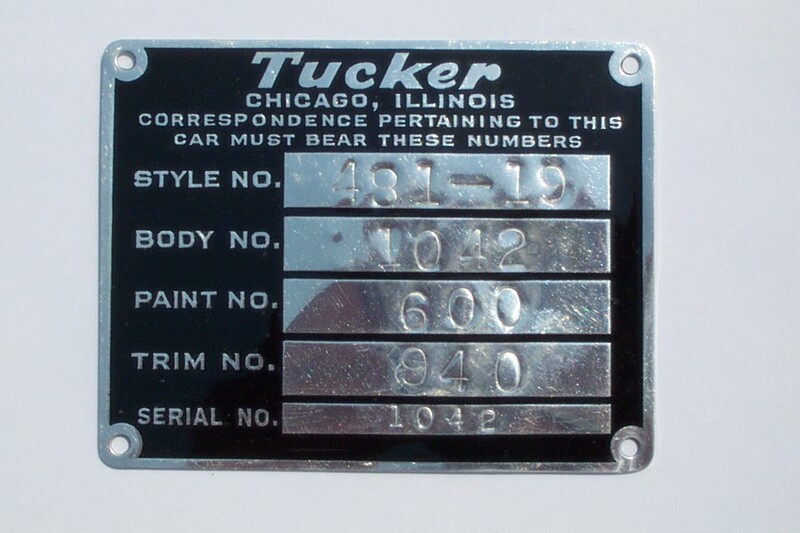 : 1030 ( the actual number of that Tucker, in this case Tucker number 30 - Production Tuckers started with number 1001 ). 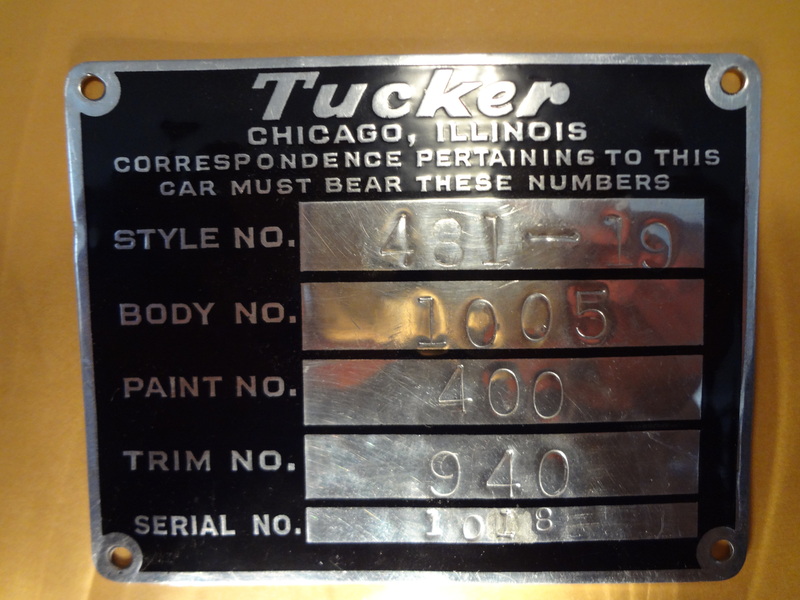 Many thanks to the good people at the Peterson Automotive Museum, for permission to photgraph the Data Plate of Tucker number 30 ( 1030 ).